Your Grand Canyon vacation begins with a scenic flight from Las Vegas, over Lake Mead and the western section of the Grand Canyon. 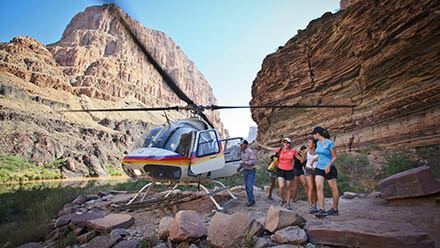 On the north rim of the canyon, you will delight in a thrilling helicopter ride from the remote landing strip down into the depths of the Grand Canyon on the edge of the Colorado River. Here, the Colorado River’s famous rapids, though still exciting, are a bit tamer. Scenery in the lower 100 miles of the Grand Canyon is astounding. Massive sandstone cliffs conjure up imaginary shapes. Hidden waterfalls and pools carve their way down to the river. Wildlife is abundant, with frequent sightings of elusive Blue Heron, soaring hawks and eagles, and majestic Big Horn sheep. At night, the canyon walls unveil a heaven of innumerable stars. 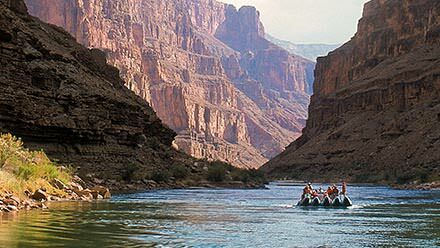 To top it off, Western’s Grand Canyon 3-day rafting trip offers easy access from Las Vegas, Nevada. 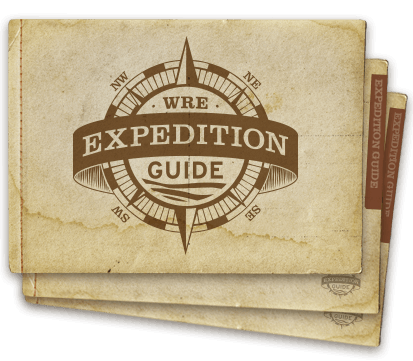 Come join Western River Expeditions on an incredible and unforgettable Grand Canyon journey. Meet in the lobby of The Las Vegas Marriott, 325 Convention Center Dr., Las Vegas at 6:00 AM. Enjoy a beautiful flight to the Bar 10 Ranch on the rim of Grand Canyon. Shortly after your arrival to the Bar 10, a helicopter will take you deep into Grand Canyon to join your welcoming crew and rafts. After an orientation and introductions, you'll be on your way downriver surrounded by soul stirring scenery. Hold on for Kolb and Mile 209 Rapids! Our J-Rig rafts enter awesome Lower Granite Gorge with a series of moderate rapids including Granite Spring, Diamond Creek and Travertine. 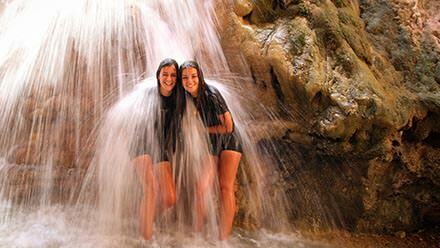 We take some time to hike, explore and play at Travertine Grotto, a fantastic series of hidden waterfalls and pools. Run the biggest rapids of the trip, the "230's." After your day of adventure, you'll savor another one of Western's delicious dinners at the river's edge and appreciate the unforgettable experience of sleeping under the stars. As you near Lake Mead, the river calms and the canyon widens. Savor your final morning in Grand Canyon as you head down river and across Lake Mead to where a shuttle will return you to Las Vegas. You will travel by way of the recently completed Mike O'Callaghan–Pat Tillman Memorial Bridge with views of the Hoover Dam. Meet in the lobby of The Las Vegas Marriott, 325 Convention Center Dr, Las Vegas, NV at 6:00 AM for bus transfer to the Boulder Terminal and a one-hour flight to the Bar 10 Ranch. Picture ID is required for all passengers 18 and older. Hotel Reservations (24 Hours): Reservations should be made as soon as possible because rooms are based on availability. Note that our special rate, and blocked spaces are released 30 days prior to trip departure, so do not delay making reservations! You mayreserve online as a Western River guest, or call 1-800-228-9290. The Las Vegas Marriott offers free parking and baggage storage ($6 for guests and $15 for non guests this fee is per bag/ per day). NOTE: Marriott reservations for the 2019 season are now available and they are ready to accept reservations. You may use the link above. The Las Vegas Marriott is located near the Convention Center Monorail Station that goes to the heart of the Las Vegas Strip. A light grab and go breakfast is available for our Western River guests. Once your jetboat arrives to the takeout ramp on Lake Mead, you'll grab a boxed lunch as you board a motor coach for Las Vegas. The return motor coach should arrive in Las Vegas at the Marriott Hotel in Las Vegas by 3:00 PM on the last day of your trip. We highly recommend that you stay another night in Las Vegas. However, if you choose to fly out the same day as your trip ends, make sure you book a late evening or night flight out of Las Vegas to ensure you have ample time to get to the airport. Taxi, Uber or Lyft service is available from the Las Vegas Marriott to the airport.